Invasive Species in top image, from left to right: Japanese knotweed, European frog-bit, Black swallow-wort, Garlic mustard, Phragmites. Photos via Creative Commons. You’ve probably heard the names of a few of the invasive species that plague Michigan: zebra mussels, emerald ash borers, phragmites. But those well-known unwanted visitors just scratch the surface of the 75 invasive species the Michigan Department of Natural Resources (DNR) has identified in the state. And if it sounds difficult just to keep track of those species, controlling or eliminating them makes for a truly Herculean task. But over the past decade, collaborative efforts in Michigan to keep invasives in check have been increasingly successful. Through cooperative invasive species management areas, or CISMAs (pronounced SIZ-muhs), land and water stewards form regional partnerships that engage local, state and federal governments, nonprofits, businesses and individual citizens in collaborative efforts to attack the invasives that affect their regions. The United States Forest Service (USFS) funded Michigan’s first CISMA, the Western Peninsula Invasives Coalition, in 2006. That CISMA covers three of the westernmost counties in the Upper Peninsula. Initially, CISMAs grew primarily in the UP and northern Lower Peninsula, thanks to USFS funding for invasive management efforts on the plentiful federal forestland in those areas. But southern Michigan had plenty of invasives too, and little federal land to attract USFS funding. The southern half of the state got its first big shot at the CISMA game in 2014, when governor Rick Snyder proposed and the Michigan legislature approved $5 million in funding for invasive species management, with $3.6 million earmarked for grants to be administered by the DNR through the new Michigan Invasive Species Grant Program (MISGP). In handing out MISGP grants, Tangora says, “one of our big focuses was to fill in the state with additional CISMAs.” The funding and grant allocations repeated last year, and a total of 17 CISMAs now cover the entire Upper Peninsula and most of the Lower Peninsula. All of them bridge multiple counties. Click on the colored areas in the map below to find out more about CISMAs across Michigan. Although CISMAs have caught on widely in Michigan in recent years, we certainly didn’t pioneer the concept. The idea originated in the rangelands of the western United States in the early ‘90s, where in many states landowners are required by law to eradicate certain plants. The original CISMAs didn’t go by that name at all; they were called cooperative weed management areas, or CWMAs. That’s because the biggest concern out west is noxious weeds–native plants that interfere with agriculture and natural resources, as opposed to invasive species, which are introduced from other areas. Chris Evans is an extension forester and research scientist at the University of Illinois who has worked in invasive species management for over a decade. He says CWMAs originally formed as a practical way to fulfill legal requirements for treating certain weeds. Nonetheless, it still took some time for the concept to catch on farther east. New York implemented the idea with its own name–Partnerships for Regional Invasive Species Management, or PRISMs–in 2005. Since then, Evans says, the number of such organizations has “exploded” across the eastern U.S. However, he says the approach in Michigan is somewhat different due to the more complex interactions between private and government landowners, and the more limited government infrastructure for managing unwanted plants. With that came a shift in nomenclature as well. Although there are still a few CWMAs in Michigan, most are now identified as CISMAs. The nonprofit Upper Peninsula Resource Conservation and Development Council (UPRC&D Council), a partner in all five UP CISMAs, has since 2013 obtained multiple federal and state grants to attack the invasive reed. The UPRC&D Council then issued subawards to UP CISMAs, funding treatment of over 2,000 acres of phragmites over the past three years. The plants have mostly been concentrated along the Lake Michigan shoreline and haven’t yet spread inland as much as they have downstate. That’s not to say that the downstate CISMAs aren’t throwing everything they’ve got at stopping phragmites’ more entrenched presence. Each CISMA sets its sights on addressing the biggest threats to its region in the best way it can–and those strategies are effective due to the diverse talents they bring to the table. Those at the table can include just about any Michigander who lives within a CISMA’s boundaries. Tangora encourages those interested in getting involved with invasive species management to identify and reach out to their local CISMA through the Michigan Invasive Species Coalition. She says the UP CISMAs’ work with phragmites proves that there’s no challenge too big for Michigan CISMAs. You recently underwent the transition process from being a cluster of the Stewardship Network to becoming a CISMA. What are your goals now? Rayner: Currently we’re working on three different projects or grants. The first funding source, and my main project to work on, is our Michigan Invasive Species Program Grant. That’s a large grant and our focus is implementing on-the-ground work. In our eight counties here in west Michigan, we’re using a lot of the money for staff and to hire in-house strike teams. We’re hiring individuals to go out to survey for these plants, to map them, to treat them. In addition we’re also doing a lot of outreach, making educational materials and doing educational events and programs to educate and inform on what the issues are. Our second big grant is a Sustain Our Great Lakes grant. That is a subaward through the Nature Conservancy. They set aside 15 county, state and local parks along the Lake Michigan coastline from Allegan County up to Ludington State Park and crafted a specific list of plants that were very high-threat, very important plants to deal with. We’re really getting into those parks and focusing on those dunes because they’re such a rare and special habitat. Our third set of grants is through the Forest Service. They’re smaller grants but they’re kind of a catch-all. We’ve got some money in there to treat plants on private lands. We’ve got some money for educational booth displays and to attend conferences and speak at conferences, to network and learn what other groups are doing. There’s a lot in those Forest Service grants to kind of piece everything together. What is your involvement with monitoring the Chinese yam population in west Michigan? Rayner: [DNR invasive species coordinator] Sue [Tangora] got a hold of me and told me she wanted me to go down to southwest Michigan with her to look at a new plant that had entered the state. It was the only site in Michigan where Chinese yam was known up to that date. We looked at the plant, looked at the site and became familiar with it because it’s on the watch list and it’s something we’re looking for. A month and a half later, I was in the Holland area just north of Lake Macatawa, looking at some Japanese knotweed sites. We had done some treatments there earlier in the year and I went back out there to look and see how successful those treatments were. I was looking at these plants and I look over and there’s another plant I don’t recognize. I was like, “What is this? I know this. This plant’s really familiar.” I got in my car, I drove five minutes and I was like, “Oh my gosh, I know exactly what that is.” I went back the next day to follow up and it was in fact Chinese yam. The next day I went back to kind of further survey. I knocked on doors, looked all around and found two or three little patches of it in the area. Unfortunately it was too late in the season to treat it, so we missed that window. But we plan on following up this year. So do you stand to basically nip Chinese yam in the bud in your region, possibly the whole state? 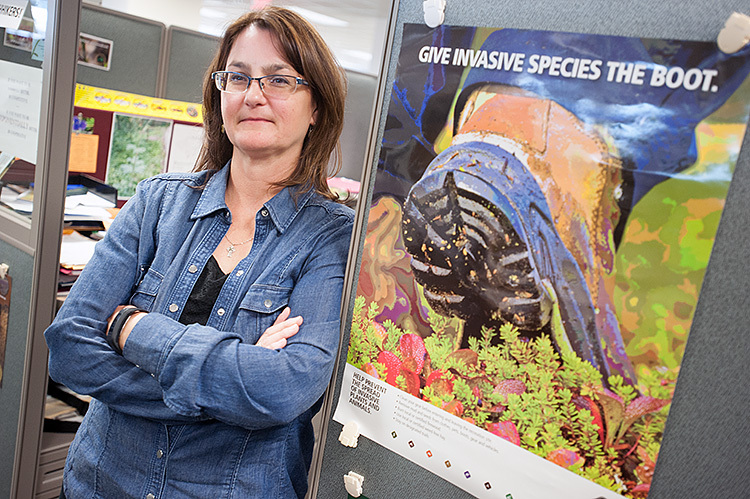 What are the advantages to using CISMAs to combat invasive species? Rayner: I think CISMAs are really unique and really powerful for the fact of being local, and because of the partnership side of it. Obviously it’s easier to get work done if you know what’s going on in your backyard. If you drive down these roads every day, if you’re constantly out and about running errands and stuff like that, you’re very aware of what’s happening around you. I have people in my office that are connected to every landowner. I swear I can describe intersections and people can tell me, “Oh, this is the person who owns that land.” That local connection is really nice, being able to see everything everyday. I think we’re currently working with 45 partners in eight counties. When you have that many people at meetings and at our planning sessions, available to you, there’s somebody who can help you with everything. You really get everyone working together and focusing on things instead of everyone doing their own thing and duplicating efforts in the same area.